Designed and built for extended days away, 'Thora' is a sturdy, classic build from the renowned Millkraft team and presents in lovely condition thanks to her meticulous owner. Her single level, open plan layout makes her feel enormous inside yet she's an easily manoeuvrable bay cruiser with a superb Gardner diesel pushing her along at a gentlemanly 7.5knots for less than 5 litres of fuel per hour. She can sleep up to eight people but is best suited for a family of four who can spread out in either the saloon, rear cockpit, fore deck and even on the saloon roof. With loads of storage space, good size galley, nice hot water system, genset, tender davit crane and quality instruments, she's a beautifully comfortable cruiser ready for new adventures. Please contact Australiawide Boat Sales in Manly Queensland to arrange an inspection. The last 3 months has seen 'Thora' fully serviced, repainted inside and out, slipped, antifouled and presenting in tip top condition. Timber Oregon planks on Spotted Gum Frames. Fibreglass over marine ply with Silky Oak cabin sides. 52hp 4LW, 4 cylinder in board diesel swinging a 3 blade fixed bronze propeller on a stainless steel shaft. The engine has been superbly maintained and runs beautifully, delivering a top speed of 8 knots and using a frugal 5 litres per hour. 2 x 350 litre steel tanks. 510 litres in total via a 450 litre steel tank and a 60 litre tank. Spacious bench tops with stainless steel sink, microwave and plenty of cupboards and dry storage space. 2 x Eutectic / 240v refrigerator. 1 x large front loading refrigerator, 1 x very large top loading refrigerator / freezer. 35 litre "Woody's" hot water tank. Large open plan layout featuring 4 large single berth forward and 2 settee berths in the main saloon / galley / helm area, in addition there are 2 additional single settee berths at the rear deck. The engine bay sits in the middle of the saloon, it's insulated housing forming the large drop leaf dining table. At the rear deck there's a fold away table and BBQ stand. The spacious heads is located in the forepeak. Large windows forward, port and starboard provide an abundance of light and ventilation. Headroom is around 2m. 6 but capable of sleeping 8. 32' flat screen TV with built in DVD player. 3.7m Nomad aluminium tender stored on a cabin top cradle with electric davit crane. Cockpit side and rear covers wih sun screens, sun shade covers for forward windows. 60lb CQR anchor with 200ft of chain electric anchor windlass, sea water deck wash.
All basic in date inshore safety gear. 4 deep cell 6v batteries, 240v shore power inlet with smart charger. Autopilot, Raymarine 12" chartplotter, radar, depth sounder, compass, Icom VHF. Electric dingy crane davit, large teak duckboard, swim ladder, lazarette, stainless steel pulpit, grab rails, deck / anchor wash, bronze ports, fenders and mooring lines. 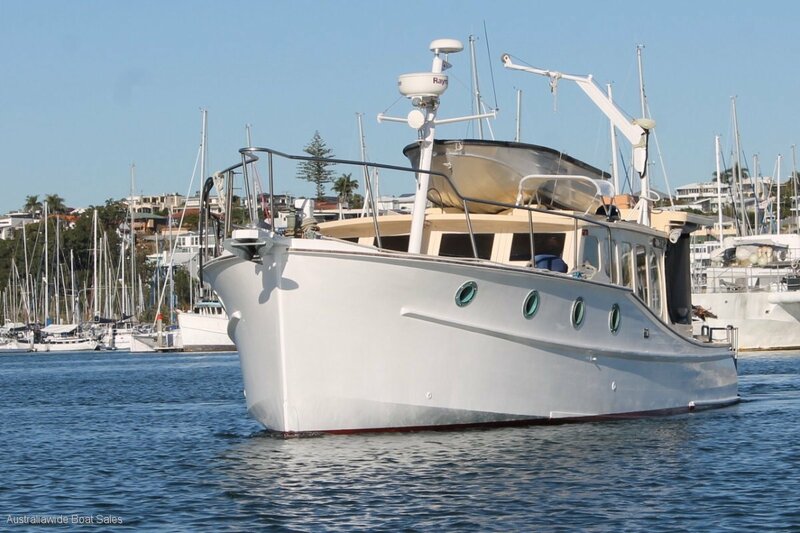 Australiawide Boat Sales offers the details of this vessel in good faith but cannot guarantee or warrant the accuracy of this information nor warrant the condition of this vessel. We recommend that the buyer should instruct his surveyors to investigate details and fitness for purpose.